For my birthday, AngryRussian took me to Miku for dinner. As it was the holiday season, Miku had a special holiday menu of six courses ($125). The appetizer course had 7 small items itself!! We both decided to do the special set menu, and we noticed that a lot of patrons that night did the same also. 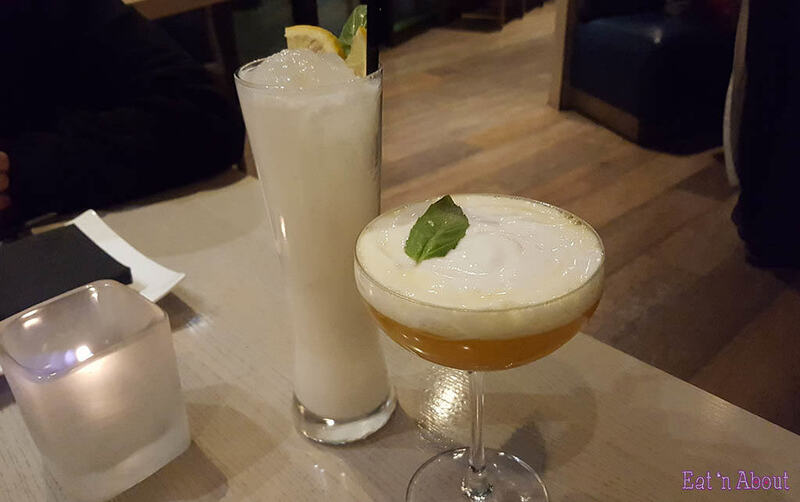 On the left is AngryRussian’s Coconut Cooler ($13) made of beefeater gin, coconut puree, lemon, fresh basil, and sparkling water. I had the Miyazaki #2 ($15), made of havana club seven year rum, ginger liqueur (where can I get some of that?? ), mango puree, and topped with basil citrus foam. It was mighty tasty. I love anything gingery and this had loads of gingery flavor. The foam was more citrusy than basil-y, and THICK! And off we start with the food! 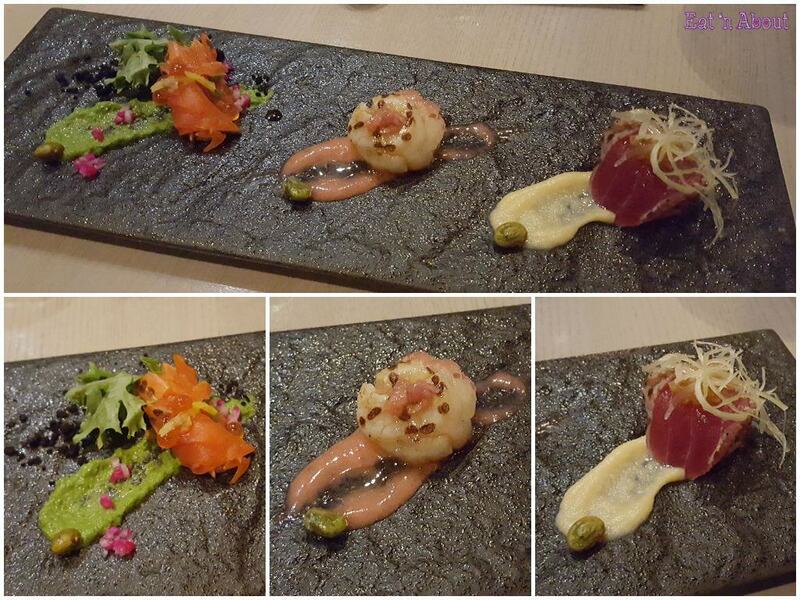 First course was the Amuse Bouche and it was a course of Miku’s Aburi Sashimi Selection. Tonight the selection consisted of salmon with black olive dust, scallop with strawberry salsa and vinaigrette, and red fin tuna with miso. All of the sashimi pieces were flame-seared, as is the case with anything “aburi”. My favorite was the red fin tuna. I found the scallop lacking the sweet flavor usually found with scallop sashimi, and the strawberry-themed garnishes didn’t really go with the shellfish. The black olive dust was very interesting with the salmon. I liked it but AngryRussian didn’t…he hates olives. 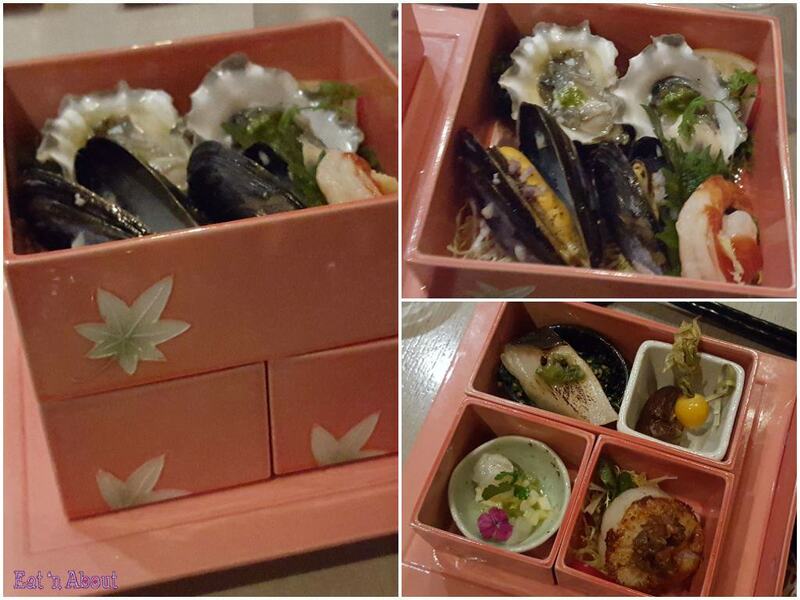 My favorite items were the oysters, the sable fish, the prawn, and the scallop. The two oysters were of different types but I forgot what they were. One had more salinity than the other and I preferred the saltiness. Sable fish is always delicious, and the scallop this time were perfectly seared and had the sweetness I wanted. It was huge to boot. The mussels were served cold, overcooked, and had no flavor, even with the mignonette which was actually quite difficult to detect. The foie gras again had no flavor or seasoning, and was hard and cold. It was difficult to find any lobster in the lobster tartare, as the tiny cubes were crunchy which tells me I had a dish of accompaniments rather than lobster bits. I also couldn’t see traces of candy cane beets. 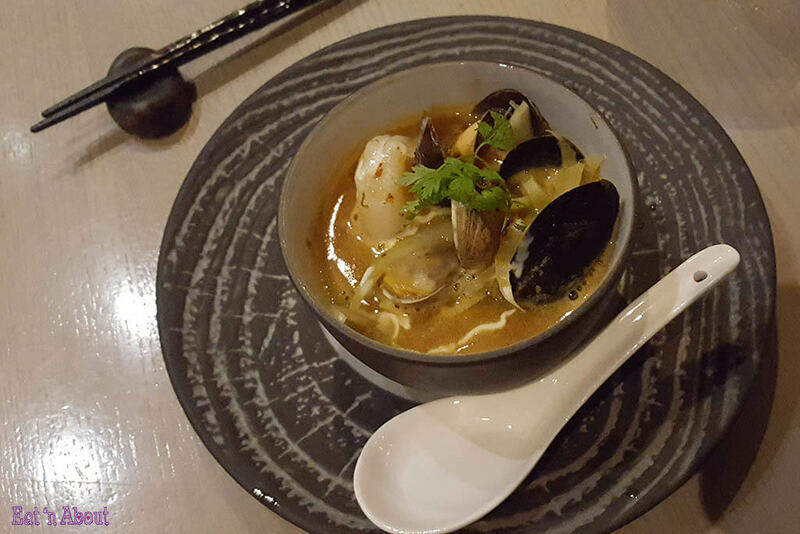 Third Course was titled “Sea” and was a Lobster Kaisen Bisque with prawn, mussel, scallop and clam. The bisque was hearty and delicious. It had loads of lobster flavor and the seafood inside were delicious. This was served quite hot and really warmed us up. 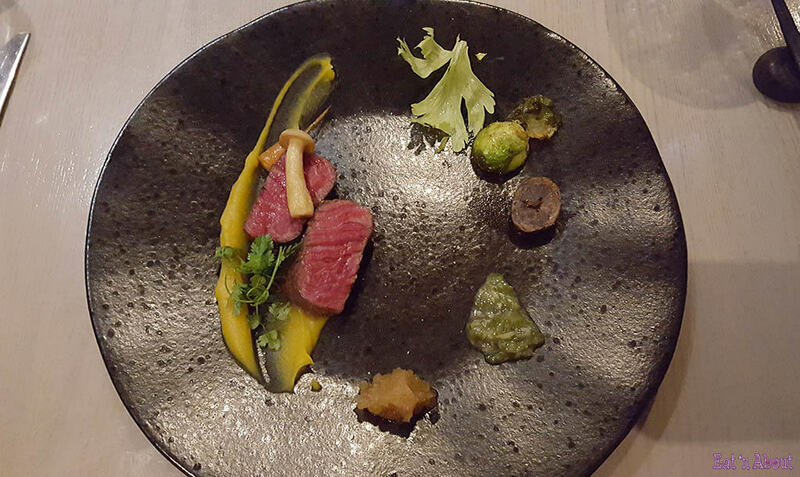 Fourth course was a “Land” course of American Wagyu Beef. The menu described the course as served with quinoa (where was it? ), seasonal vegetables, ponzu daikon sauce, and pink salt. The two 3 oz pieces of wagyu were fatty and delicious, and tender enough to be sliced by a butter knife. We did laugh about the half piece of brussel sprout on each of our plates though…that in total we got one mini brussel sprout. And half a mini potato. And one celery leaf. 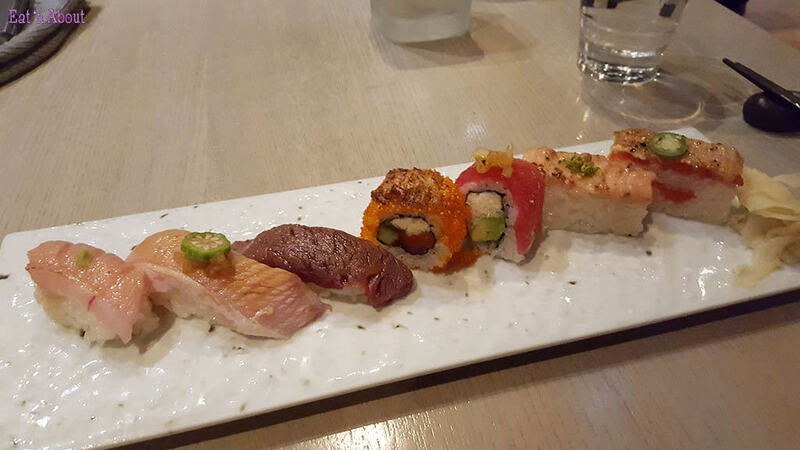 Fifth course was their famous Miku Signature Sushi course which included a selection of Aburi oshi, roll and nigiri. Can’t remember every item but there was definitely a piece of Albacore belly nigiri, an American wagyu beef nigiri, a piece of Sunset Roll, and a Salmon Oshi sushi in there. Dessert course was the Miku Champagne Citrus Praline Bavarois. 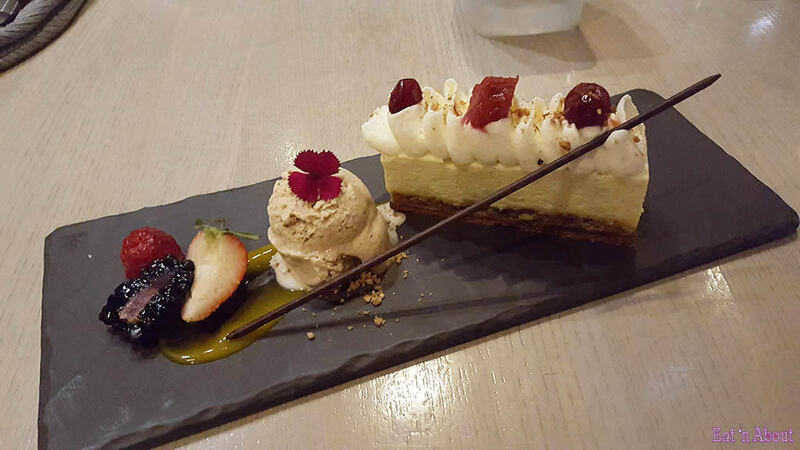 It had a hazelnut base that tasted like crushed Ferrero Rocher, topped with a layer of champagne cream-mousse and citrus mousse, with a bit of red fruit compote. Accompanying it was saigon cinnamon ice cream that tasted like cinnamon hearts.